In this week's Now Playing, Phil gets to grips with Shadow of War's Nemesis system. In Now Playing articles PC Gamer writers talk about the game currently dominating their spare time. Today, Phil takes time out of editing magazines to make pals in Shadow of War. I'm not sure what to expect from Shadow of War. On the one hand, I’ve little interest in Lord of the Rings, and no desire to spend any more time with returning protagonist and charisma vacuum Talion. On the other hand: the orcs seem fun. I decide to give it a shot, in the hope of encountering a potential nemesis. Once I’m let loose on the starting area of Minas Ithil, I go hunting orc captains. Some ambush me while I’m in the middle of a fight. Others are big, tough and difficult to dodge away from. All, eventually, go down. I’m good at Shadow of War’s combat—at least this opening version of it—because I’ve played three Arkham games and it’s basically the same. I start ticking off sidequests and missions. It’s as I’m running between these that I aggro Koth, the “poisonous dark beastmaster”. Koth’s specialties include multiple things I haven’t seen before, all of which are bad. Poisonous means his weapon deals damage over time, which is bad. Beastmaster means he’s flanked by giant Caragors—also bad. I’m unsure what the “dark” refers to, but I doubt it’s his favourite type of chocolate. He gets in some good hits, and soon I’m close to death. I attempt to rally, and even manage to take off a chunk of his health, but then I’m ambushed by yet another orc captain. Koth uses the distraction to finish me off. Finally, I have a nemesis. Nowadays, Sun Tzu is only referenced by overachievers on TV shows about lawyers or CEOs or crab fisherman, but I’m starting to think that knowing my enemy might be a good idea. Every orc has strengths and weaknesses, but they’re hidden until I extract them from the mind of a subordinate. I do so, and discover that Koth is vulnerable to executions. So we have that in common. Koth runs away every time I go in for the kill. This cat-and-mouse game gives me time to get to know him better. I’m pleased that my nemesis is no stereotypical warmonger. Yes, he’s adorned with skulls and piercings, and his face is stained and messy—all orcish traits. But his received pronunciation accent gives him an almost regal bearing. The overall effect is of a Shakespearean thespian playing a Mad Max bandit, who also happens to be four plates deep into the backstage buffet cart. I like him. Finally I get the drop on him. As we fight, my combat meter charges up. When it’s full, I unleash an execution attack. Koth goes down. He’s dead. I return to the objective grind for another hour, but my heart isn’t in it. 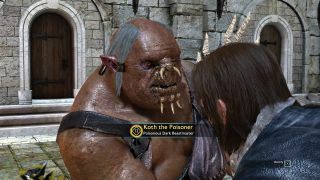 Shadow of War is less interesting without a nemesis. But as I sprint towards my next objective, I’m interrupted by a familiar accent. It’s Koth. He’s cheated death, and is now explaining in detail all of the things he’s about to do to me. My nemesis is back, and I couldn’t be happier.